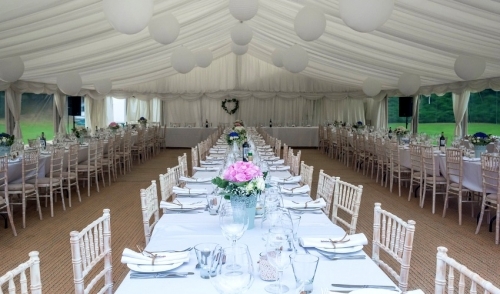 Trying to figure out what size tent you'll need for your next wedding or event may seem like a daunting task. Luckily, the rental industry has developed standard formulas to help make this job easier. What type of event is it? For weddings, will ceremony or row seating be required? What is the maximum number of guests that could be present at the same time? Weather is a big factor. If it begins to rain, everybody will want to be under cover & dry. Is there going to be a bar or beverage station? How will the food be served or eaten? The shapes and sizes of buffet and dining tables must be considered. Dance floor - 5 square ft per person (not everyone will dance, so allow for half of the guests). Bar area - 100 square ft.
Buffet/beverage station - 100 square ft. for every 50 people. Seated dinner 8' Banquet Tables - 10 square ft. per person. Seated dinner 5' Round Tables - 12 square ft. per person. DJ area - 100 square ft.
Ceremony/Row style seating - 7 square ft. per person. These formulas will help to give a clearer picture of the size and layout of what you will need, as well as the impact on your event's budget.